This brief, intended for use by finance professionals, clarifies the business benefits that finance organizations can obtain by collaborating with their peers in procurement on a common goal: improving financial results through process enablement, simplification and enrichment. The answer to siloed finance and procurement processes is simple: unify all Business Spend Management through a common set of technologies (or fully integrated technologies). Finance organizations that partner with their procurement counterparts to design and implement a unified BSM solution will be able to route all spend into automated processes and business intelligence analytics. These in turn will create the necessary foundation to support complete spend visibility and improve purchasing process controls. 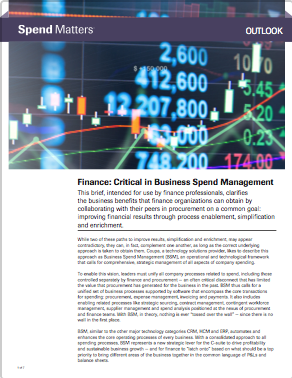 Download this whitepaper to learn the business benefits that finance organizations can obtain by leveraging Business Spend Management.